Please join us in kicking off #dontshootinmyname You can do it yourself, spread it as a profile photo on Facebook, tweet it, put it on Instagram, etc. We want to shift the conversation. Right now it's being framed as a "black issue". It's a civil society issue. It's all of our issues. We all need to step in, step up, and say no to police brutality in the name of public safety. We all deserve to be safe. Please join us to celebrate our three DPI Artists-in-Residence and their community partners! Food, conversation and an informal chance to learn about the creative work they've done over the past year. DS4SI and the Boston Foundation partner to offer new public art fellowships! 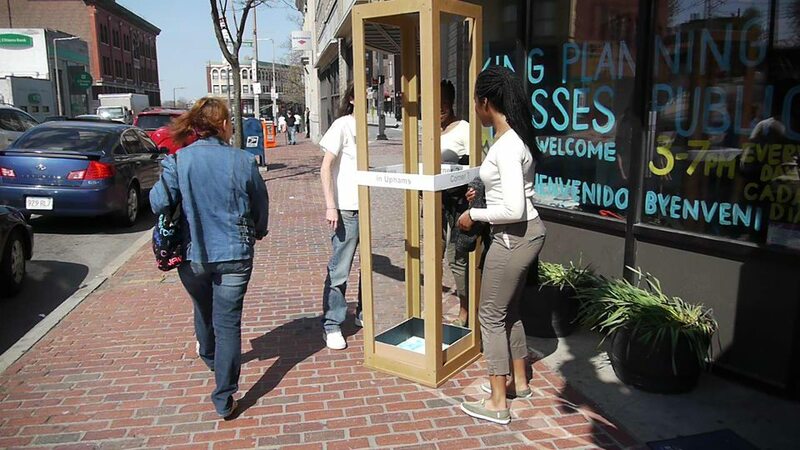 The ExpressingBoston Public Art Fellowship program will offer selected artists a 9 month fellowship with DS4SI between October 2014 and June 2015. The fellowship is aimed at supporting artists in thinking through and testing new ways to do their art practice in public spaces, in ways that increase the authority which artists and community members feel to claim public spaces in their neighborhoods. Artists will receive a stipend of $5,000 and up to $2,000 for materials for their participation in this community of practice. This fellowship is open to artists who are engaged in a wide definition of art and public art. This includes both temporary and permanent art, as well as traditional and nontraditional arts such as (but not limited to): culinary arts, dance, street theater, performance art, music, photography, fashion, body art, game design, graphic design, poetry, fine arts, social practice, puppetry, jewelry, graffiti, fabrics, ceramics, etc. 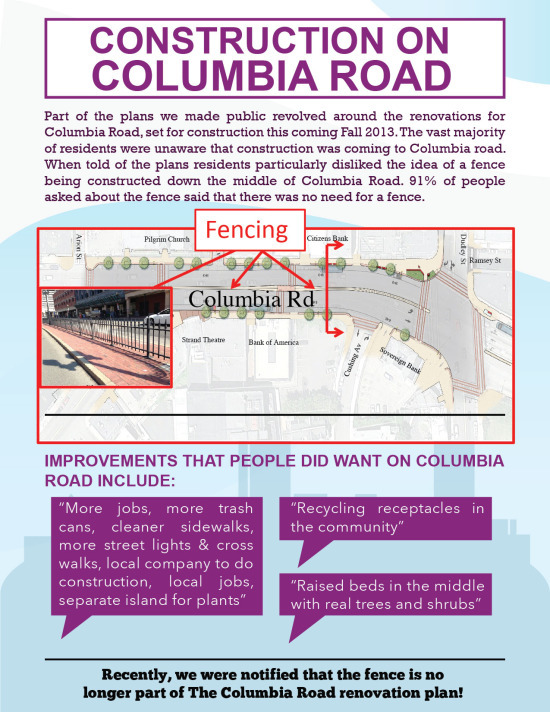 Funding priorities include supporting artists who live and/or work along the Fairmount Cultural Corridor (map) and whose art represents one or more of their community’s rich history, cultural traditions, identities and assets. We look to gather a diverse community of practice across cultural background, age, experience, gender and art practice. For more information and to apply, go to: http://bit.ly/ExpressingBoston2014 You can also learn more at our information session on July 8th, from 5:30-7pm. Many thanks to the Boston Foundation for their support for local artists and the ExpressingBoston Public Art Fellowship. 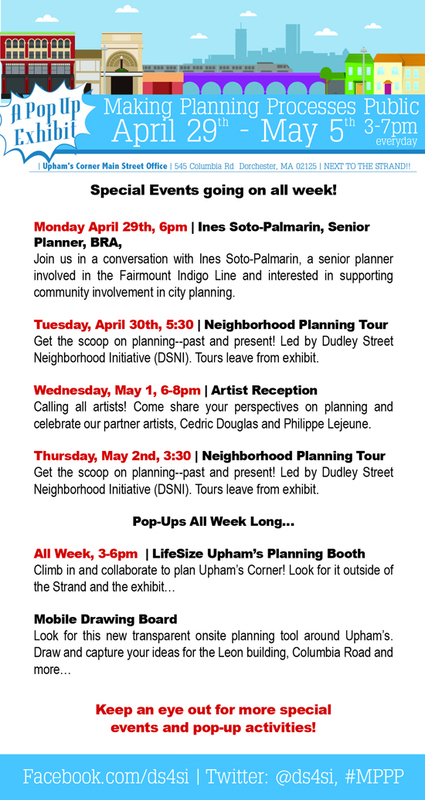 Come to Upham's Corner Artist Announcement! Kenneth Bailey and artist-in-residence Judy Leemann presenting at 2013 Creative Time Summit: Art, Place and Dislocation in the 21st Century City. Kenneth is speaking about the challenges of placemaking in the face of place breaking and social tragedy. Check out the DS4SI Vision Lab and the whole amazing Roots & Remedies 2 Conference in San Antonio. Many thanks to Youth in Action in Providence for the great video. We're looking for artists, makers, residents, merchants, families, youth, handy-folks, etc! Tactical urbanism refers to quick, often temporary, affordable projects that aim to make a small part of a city more livable, lively or enjoyable. 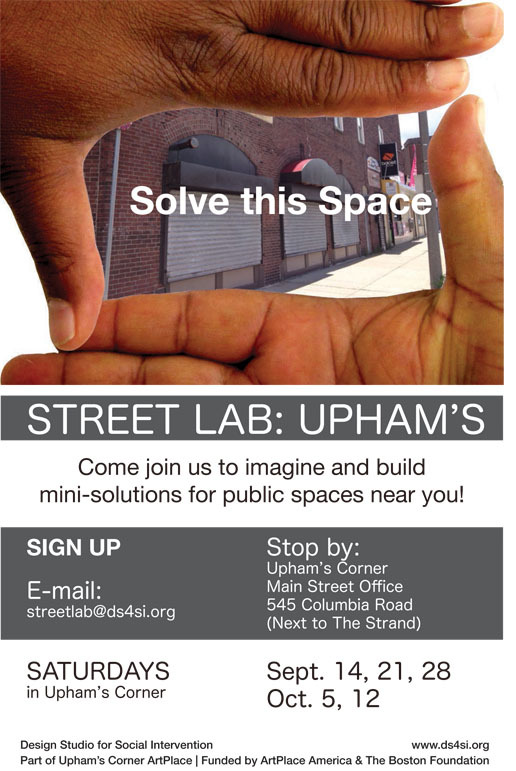 The aim of STREET LAB: UPHAM'S is to put tactical urbanism in the hands of the community by creating an open lab where community members can step in, work with local artists, designers and builders to prototype and re-imagine everyday aspects of public space. This will take place in the heart of Upham's Corner as part of Upham's Corner ArtPlace. If you have any of the following skills and are interested in working on small projects in Upham’s this fall, we would love to meet you! Come join us! 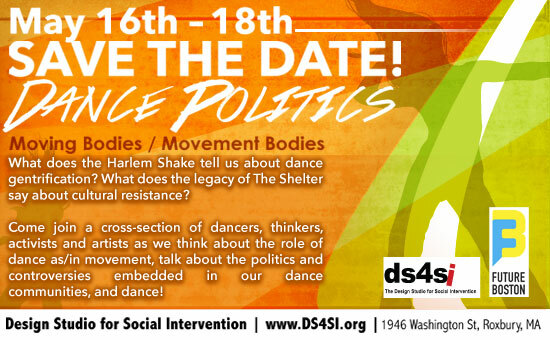 For more information, contact us via email (streetlab@ds4si.org), facebook (facebook.com/ds4si) or twitter (@ds4si). 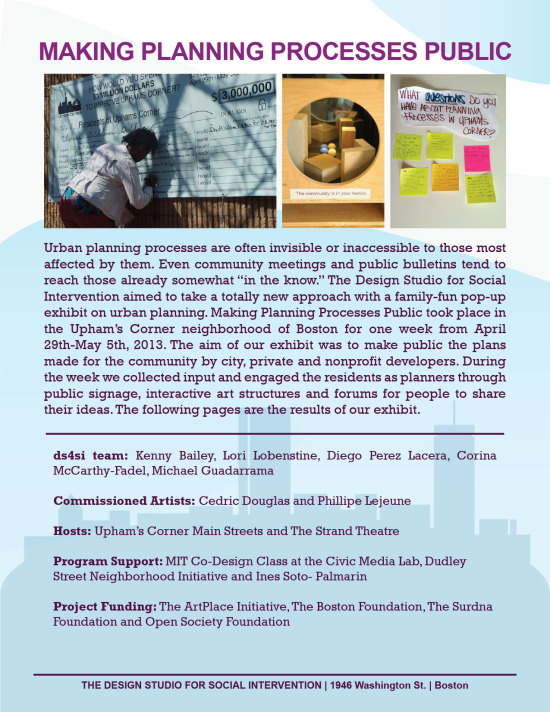 STREET LAB: UPHAM'S and Upham's Corner ArtPlace are funded by ArtPlace America and the Boston Foundation. 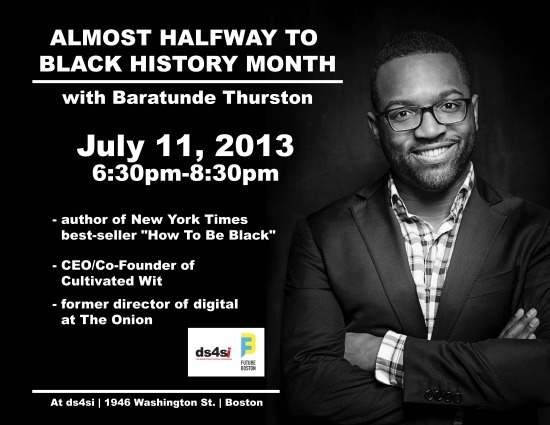 Baratunde Thurston Coming to DS4SI! DS4SI is excited to host our first "Almost Halfway to Black History Month" speaker! Baratunde Thurston is the author of New York Times' bestseller "How to Be Black", CEO and hashtagger-in-chief of the multi-talented humor site Cultivated Wit, and former director of digital at The Onion. Hope to see you there July 11th, from 6:30-8:30. After weeks of dissecting mounds of data, our talented project managers, Diego Perez Lacera and Corina McCarthy-Fadel teamed up with graphic designer Mikey Guadarrama to share back to you and the community what folks had to say about Uphams and the planning processes impacting their neighborhood. For the FULL REPORT (including all raw data), CLICK HERE. Once again, for the FULL REPORT (including all raw data), CLICK HERE. And many thanks to our amazing artists--Cedric Douglas and Philippe Lejeune, our gracious hosts--Uphams Corner Main Street and the Strand, our program support--MIT's Civic Media Lab Co-Design Class, DSNI and Ines Soto-Palmarin, and our generous funders--The ArtPlace Initiative, The Boston Foundation, The Surdna Foundation and Open Society Foundation. Photos taken throughout the week, take a look! Hope to see you at #MPPP! Many thanks to our partner artists--Cedric Douglas and Philippe Lejeune, guest speakers and tour guides--Ines Soto-Palmarin and DSNI, and generous hosts--Upham's Corner Main Street and The Strand, and funders--The Boston Foundation and ArtPlace. And to fabulous volunteers too numerous to list out--we couldn't do it without all of you. 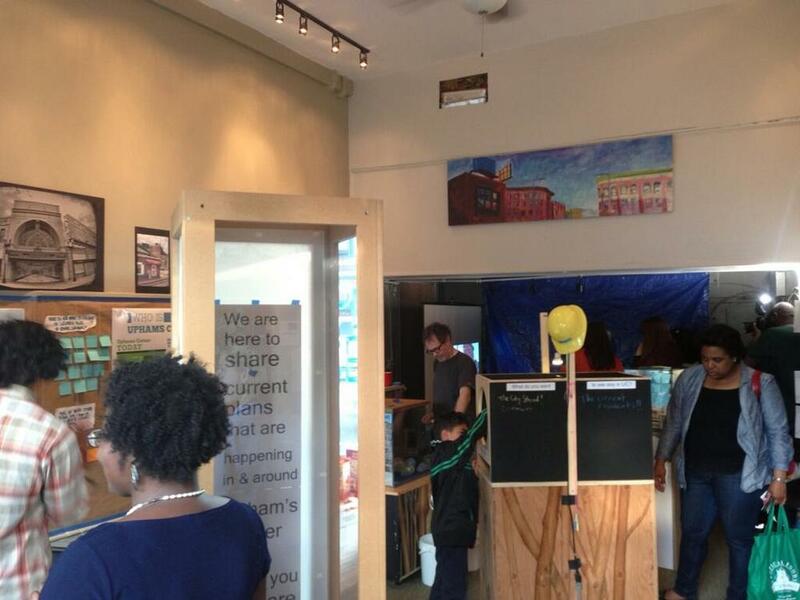 As part of our work with Upham's Corner ArtPlace, the Design Studio is putting on another pop-up exhibit in Upham's Corner. 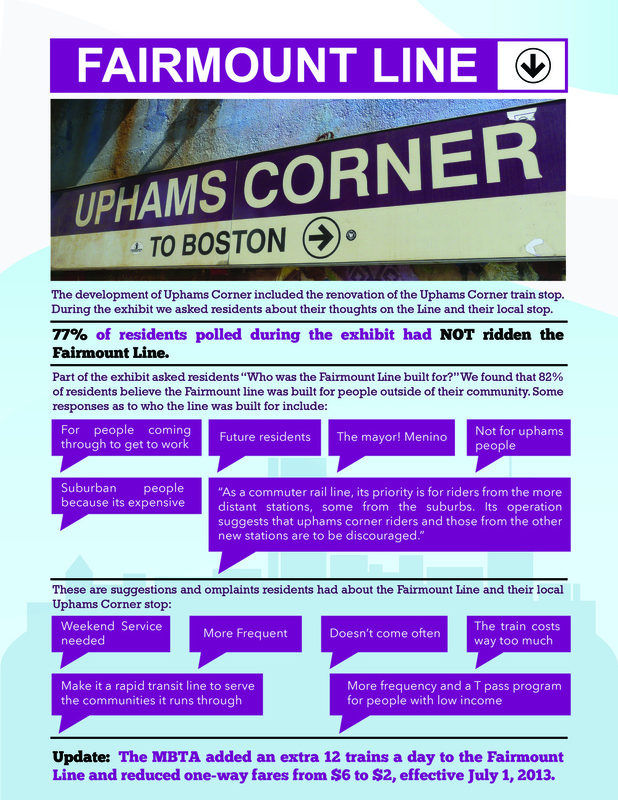 This one, entitled "Making Planning Processes Public" aims to do just that, as Upham's is slated for multiple types of investment and redevelopment. The exhbit is another chance to put "creative placemaking" in the hands of community residents and to use the skills and creativity of local artists to invite residents deeper into the planning processes. We are excited that Upham's Corner Main Street is hosting us again and thriled to be working with local arists Cedric Dougles and Philippe Lejeune. (They're going to blow your mind!) We are grateful to funding from The Boston Foundation and ArtPlace, and partnerships with Dudley Street Neighborhood Initiative and MIT's Center for Civic Media's awesome Co-Design class. Finally, our MPPP interns, Corina McCarthy-Fadel and Diego Perez Lacera have been tireless and invaluable! Please contact us if you would like to volunteer! We would love to have you. The exhibit will run from April 29th--May 5th, from 3-7pm each day. More event details coming soon. And many thanks to our allies at Future Boston. Come Friday night to the activist chef competition and see 4 teams battle it out for the 1st ever title of EXTREME [RADICAL] CHEF! Our 4 fierce teams are: Crisco Inferno, Black Ramen, Haley House and The Food Project. See you at the Greenhouse!